If you would prefer to view tutorials and online training resources, try our Technology Help page. Or view our Computer Class Calendar to see traditional classes and our 1:1 training option for non-residents, Digital Grandparents. Can I sign up for an immediate appointment? We ask for at least 2 business days notice to ensure librarian availability. Weekends and holidays may take longer. Who is eligible to schedule an appointment? 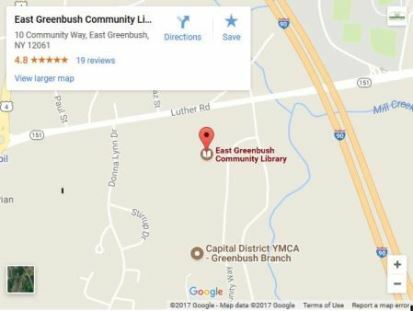 East Greenbush/Schodack resident cardholders in good standing may book appointments. Appointments are available Monday through Friday. We will do our best to accommodate your first choice of date and time. Please allow at least 2 business days for us to arrange an appointment, allowing extra time for weekends and holidays. Please fill out this online form or call the Reference Desk at (477-7476 option 4). Please be considerate and call the Reference Desk (477-7476, option 4) to cancel in advance if you are unable to make your appointment. Check in with the librarian at the Reference Desk for your appointment. The librarian at the reference desk can help with quick inquiries. This service is for more in-depth help. We can get you started with basic computer skills, help you learn about a new device, or assist you with a specific issue that may require extended instruction. Is there any kind of help I can't get? We cannot offer advice (e.g., medical, legal, investment) except to advise users of reputable sources of evaluative information. In addition, we cannot type or proofread your document, cover letter, resume, etc. Please note that these sessions are meant to be instructional only. Our mission is to give you the tools necessary to complete your project. Sessions can be 30 minutes or one hour. How often may I use this service? Limit one hour per month (in one or two appointments) per patron/business. It depends. If you would like general assistance or instruction, the library can provide a laptop or, in some cases, other types of devices. If you have needs specific to a program, operating system, or device you own (such as a smartphone or e-reader), please bring your own laptop or device. Absolutely! Call or stop by the Reference Desk (477-7476 option 4) anytime we are open. Or, you can submit an email request using our Contact Form.